Like fashion or music, office design is influenced by trends. From drab cubicle farms and prestigious corner offices 1980s and 90s to today's open spaces and emphasis on collaboration, workplace design has evolved to incorporate flexibility and creativity. As smart companies think more about how employees work and what they need to be effective, important trends are emerging, says Leigh Stringer, director of innovation and research at New York City-based architecture and design firm HOK. Three companies have been influenced by trends in collaboration, health and wellness, and employee satisfaction. Trend: Tear down the walls. Stringer sees companies opting for low walls and clusters of workstations that are smaller than the grey cubicles of the Office Space era. This trend is fueled by the desire to encourage collaboration and use space more efficiently, she says. These influences can be seen in the Florida office of architecture and design firm RTKL. When the firm moved into Exxon Corporation's former Miami headquarters, employee spaces had fewer walls and workstations were smaller. To reduce noise, the firm installed a white noise system. Jorge Bernal, an architect with the firm, says the low hissing sound is barely noticeable, but softens the highs and lows of human voice, making it less distracting. Small conference rooms provide refuge when employees need quiet or a space to meet one on one. "We have a mixture of settings that allow for anybody, regardless of whether they're introvert or extrovert—they can find their own space at any given time," Bernal says. At first, employees weren't happy with the loss of space and privacy, but as they grew accustomed to the open plan and flexibility, they see it has actually helped them collaborate more effectively, he says. Rodale's NYC office stairway to fitness. Trend: Save space for wellness. Stringer's clients are clamoring for ways to encourage employees to stay healthy and fit and have started asking for these elements in office design. She has seen requests for everything from more staircases to ergonomically adjustable desks and even spaces that adjust to allow employee to work while standing. As a publisher of many health and wellness magazines, the Emmaus, Pa. headquarters of Rodale, Inc. is ahead of this trend. When the company opened its New York City offices, it devoted expensive square footage to a two-story employee yoga studio and a coffee bar. Instead of hiding its staircase behind closed doors like many buildings, the beautiful cherry structure sits front and center in the reception area, encouraging employees and guests to get exercise by taking the stairs. Facilities director Jim Hersch says even when classes are not scheduled, employees often reserve the studio to practice yoga on their own or to work out as a group. Rodale even has a few treadmill desks that allow employees to walk while they work. "We are always hearing that employees come to Rodale because they want to work in a place that connects with their personal objectives and goals--both in terms of career and a healthy lifestyle," Hersch says. And keeping employees healthy can pay off. A 2010 Harvard University research analysis found that, for every dollar invested in health and wellness initiatives, companies save $3.27 in employee medical costs and absenteeism costs drop $2.73. For Rodale, there's been an added benefit: Employees bond and collaborate in these spaces, increasing engagement and good ideas in addition to good health. 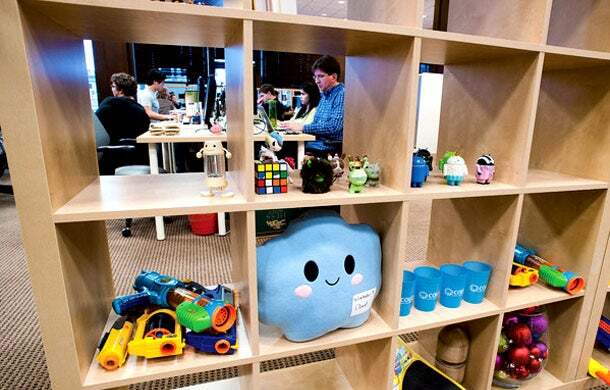 Online procurement platform Coupa keeps a sense of humor with fun cubbies that house everything from photos to toys. When you create a fun place to come to work, employees tend to stay longer, says Stringer. That's true for San Mateo, Calif.-based procurement platform Coupa. Housed in a former bank, the atmosphere is the opposite of stuffy. 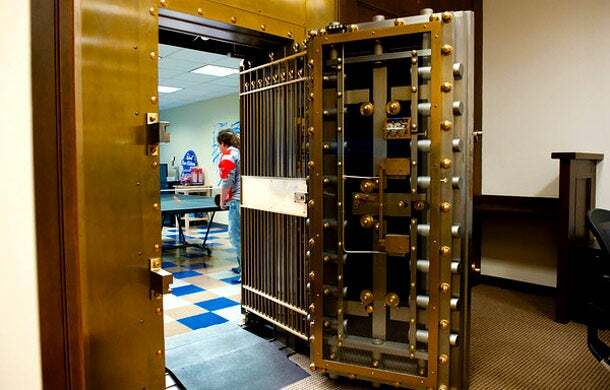 Wooden cubbies house Nerf guns and other toys, and the former bank vault has beer on tap. But don't mistake this for a slacker haven, says CEO Rob Bernshteyn. Ping pong table and beer keg in the former bank vault offer a way to unwind at Coupa. "We're doing this for the same core reasons Google figured out. You want a place where people want to be," he says. It works. When two employees stop for a quick game of ping-pong, it's not unusual for others to stop by and, soon, they're having an impromptu meeting. Team members stick around for a beer after work and brainstorm about clients. When project demands bring employees to the office on weekends, they bring their families: Kids play with the toys while spouses play some ping-pong. While cultures vary, building camaraderie and making people happy to be at the office is good business. One of Stringer's clients holds high tea for employees every workday at 3 p.m. "When you create a sense of camaraderie and community, the company benefits. You just have to find the right fit for your company," she says.